This post is by NCAT postdoc Akamu Jude Ewunkem, faculty Misty Thomas, grad student Sada Boyd, and faculty Joseph Graves Jr. Antibiotics have heretofore been used as therapeutic agents (Butler et al., 2017). However, bacteria are increasingly developing resistance to these therapeutic agents. Due to this continuum of resistance evolution there has been a stagnation in the development of novel antimicrobial agents to treat multidrug-resistance organisms. However, alternative therapeutic options are currently being exploited for treatments. 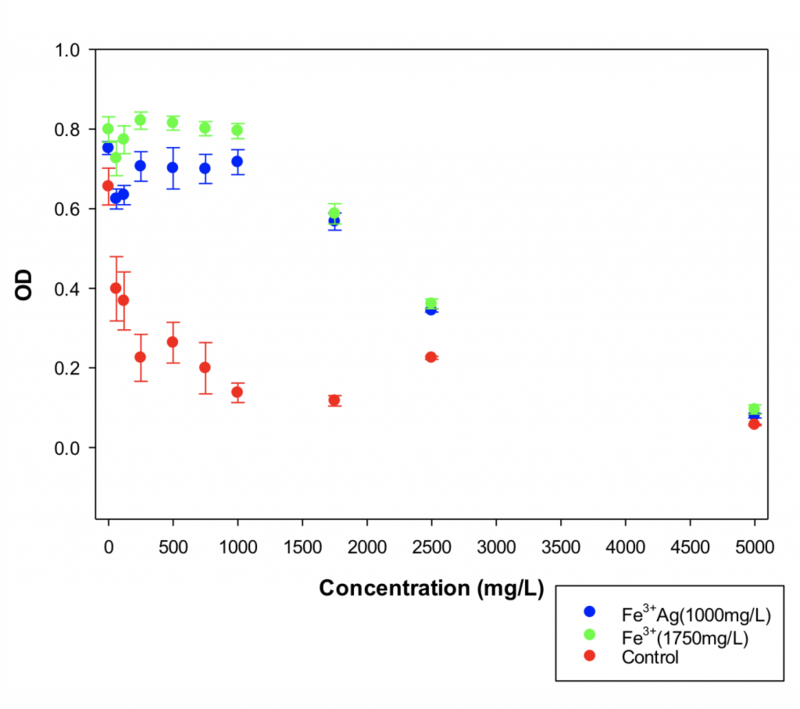 Iron acquisition is an alternate target of antimicrobial agents. Iron is an important micronutrient for virtually all living organisms. Iron is involved in a wide variety of important metabolic processessuch as photosynthesis, respiration, the tricarboxylic acid cycle, oxygen transport, gene regulation and DNA biosynthesis (Weinberg, 2009). In bacteria, iron influences cell wall composition, intermediary metabolism, secondary metabolism, enzyme activity, and host cell interactions. Bacteria use surface proteins, heme group and siderophores for acquisition of iron. The competition for iron between host and bacteria is so important that many multicellular organisms have evolved defense mechanisms that sequester iron away from pathogenic microbes. Gallium is a transition metal element, and has a similar ionic radius to that of iron. Thus, gallium can efficiently compete with iron for binding to iron-containing enzymes, transferrin, lactoferrin and siderophores. Gallium is used as a trojan horse to iron-seeking bacteria. Invading bacteria are tricked, in a way, into taking it up. However, while the binding of iron to a protein promotes protein function, the substitution of gallium for iron in a protein usually disrupts its function and may lead to adverse downstream effects in cells (Choi et al., 2017). Our laboratory is evaluating the fitness of iron resistant bacteria in gallium. We utilized experimental evolution to create 12 iron (II) and 12 iron (III) selected replicates in Escherichia coli. These cells had been selected in excess iron for 28 days. Within each selection regime, 5 had no history of silver resistance and 7 were derived from Ag+ resistant replicates (Tajkarimi et al. 2017). The control cells had no history of either iron or silver resistance. Fitness of these replicates was evaluated in the presence of increasing concentrations of Gallium (III) nitrate. Our results indicated that bacteria selected in Iron (II) as well as Iron (III) showed a significantly superior 24 hour growth in Gallium nitrate compared to the controls (Fig 1 and 2). Fig 1: Twenty-four-hour growth curve of Iron (II)-Selected E. coli in the presence of increasing concentrations of gallium (III) nitrate. Fe2+=Iron(II)-selected bacteria. 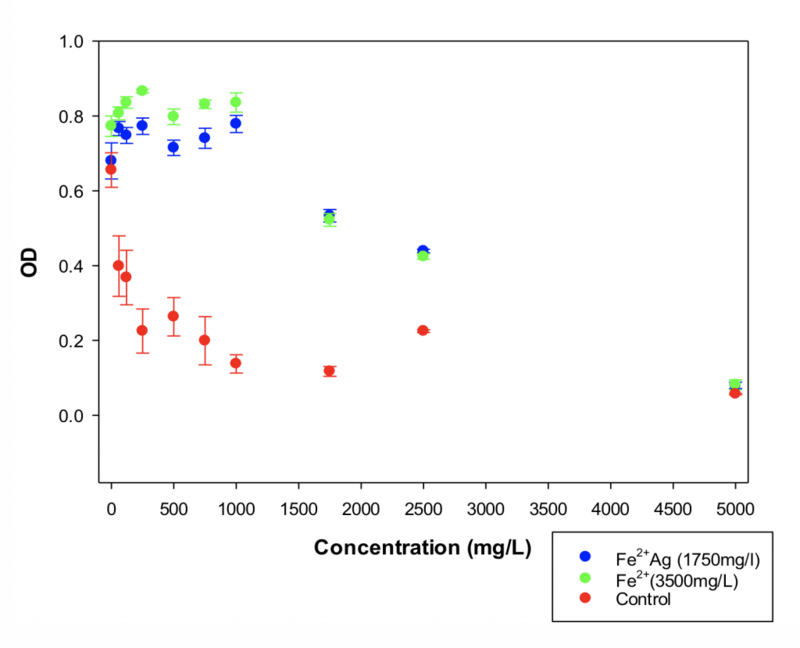 Fe2+Ag= Iron (II)-selected bacteria with silver background. Fig 2: Twenty-four-hour growth curve of Iron (III)-Selected E. coli in the presence of increasing concentrations of gallium (III) nitrate. Fe3+=Iron(III)-selected bacteria. Fe3+Ag= Iron (III)-selected bacteria with silver background. For example, for the iron (III) resistant populations there was virtually no reduction in growth from 60—1000 mg/L of gallium, while for the controls growth was completely eliminated at 1000 mg/L. Interestingly, gallium was also very toxic to the ancestors of iron-selected cells with silver background (i.e. silver selected bacteria) (data not shown). Whole genome sequencing of our iron-selected bacterial cells demonstrated that mutations occurred in genes that confer anti-transition metal stress resistance. Examples of these genes include fecA (ferric citrate outer membrane transporer), rho (transcription termination factor), fur (ferric iron uptake regulon transcriptional repressor), murC (UDP-N-acetylmuramate: L-alanine ligase), dnaK (chaperone HSP70), tolC (transport channel), and nusA (transcription termination/antitermination factor). In addition to whole genome sequencing, we utilized Nanostring technology to examine gene expression profiles of 50 genes we determined to be involved in iron metabolism or general metal resistance. We found striking patterns of expression difference in the presence of excess iron for genes: regulated by fur (ferric iron uptake regulon transcriptional repressor), involved in cell wall synthesis, general metabolism, transcription, transport, and transcription regulation. Generally, genes in these categories in the iron resistant bacteria were significantly up-regulated, while these same genes were significantly down-regulated in the controls. Thus, we hypothesize that the genomic profile and altered gene expression patterns of our excess iron resistant E. coli has also changed the way they interact with the iron analog gallium. Either these mutations reduce the rate that gallium enters the cell, increases the rate in which it is effluxed from the cell, or alter the targets of gallium toxicity once inside the cell. These results suggest that gallium cannot be used as a Trojan horse to fool iron-selected bacteria, as there survivorship in the presence of increasing gallium suggests the capacity to rapidly evolve resistance to it. We will test this idea in subsequent experiments. Butler, M. S., Blaskovich, M. A., & Cooper, M. A. (2017). Antibiotics in the clinical pipeline at the end of 2015. The Journal of antibiotics, 70(1), 3. Choi, S. R., Britigan, B. E., Moran, D. M., & Narayanasamy, P. (2017). Gallium nanoparticles facilitate phagosome maturation and inhibit growth of virulent Mycobacterium tuberculosis in macrophages. PloS one, 12(5), e0177987. Weinberg, E. D. (2009). Iron availability and infection. Biochimica et Biophysica Acta (BBA)- General Subjects, 1790(7), 600-605. Tajkarimi, M., Rhinehardt, K., Thomas, M., Ewunkem, J. A., Campbell, A., Boyd, S., … & Graves, J. L. (2017). Selection for ionic-confers silver nanoparticle resistance in Escherichia coli. JSM Nanotechnol. Nanomed, 5, 1047. This entry was posted in BEACON Researchers at Work and tagged antibiotic resistance, bacteria, BEACON Researchers at Work, Biological Evolution, E. coli. Bookmark the permalink.